to Make College More Expensive? Here's a fact that might shock you. …while at the same time the cost of a college education has increased an incredible 757%. Even the cost of healthcare, with its infamous skyrocketing costs, has only increased 401% in the same time period. EVG Research Team here to investigate why your kids' college education costs are out of control. Americans with student loan debt to cap their payments at 10% of their income. But will this executive order bring down the price of education? In fact, ever since 1978 when the Federal Government began it's crusade to make college more “affordable,” the price has skyrocketed. Prices are so high that according to a study by Fidelity Investments, 53% of grandparents are now planning to help pay for their grandkids' college costs. That's a shocking turn of events when you consider that many of these same grandparents were able to pay their own way through college with a part-time job… without debt or help from parents and grandparents. Unfortunately, college costs have far outpaced inflation since those golden days. Richard Vedder, the director of the Center for College Affordability, says that before 1978, college costs increased about 1 percentage point above inflation year over year. 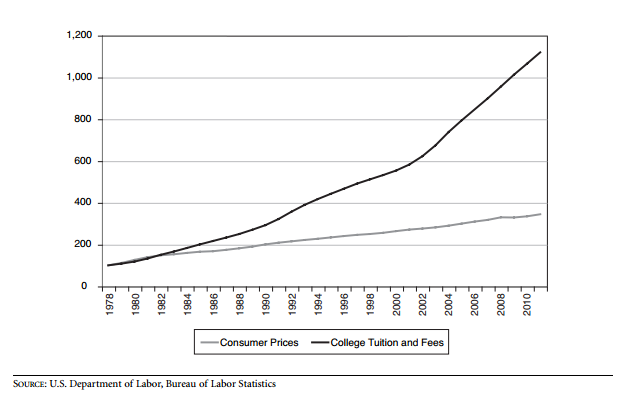 But since then, college costs have surged higher at an alarming speed, as you can see in the chart below. And the problem continues to this day. In just one year, from 2010 to 2011, college costs increased at nearly 4 times the rate of inflation. Vedder mainly blames the Federal Government for flooding the system with money, which often ends up going to college administrators and the building of athletic palaces. And it's not just his judgment. Vedder also pointed to former US Education Secretary, William Bennett, who wrote a NY Times Op-Ed titled, “Our Greedy Colleges” way back in 1987. In it, Bennett accused colleges of taking advantage of increased federal loans and grants to raise their prices starting in 1978. And like the chart above shows, the numbers support this theory. Rather than making college affordable by lowering the price, government-backed loans just make it easier for kids to take on more debt. And that gives colleges more power to charge more in tuition and fees. It's a self-perpetuating problem that could be stopped very quickly. Here's a thought experiment to show how. Let's say tomorrow, the government announces they will no longer provide student loans, nor back any student loans given by private banks. How many students would be able to afford college at today's tuition rates? In economics there's something called a “market clearing” price. If no one is buying goods or services at the current price, then prices will fall until people start buying again. So if the government announced they were out of the student loans business, college tuition would drop like a stone. The only way to fill the seats would be to lower prices until students could pay their own way again. So what will the President's Executive Order do? 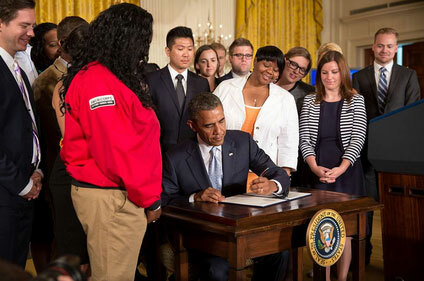 The Executive Order that President Obama signed allows 5 million more students to pay their college debts off slower. And if they go to work for the government, the entire balance of their college debt may now be forgiven after 20 years. But in no way does it help limit how far students will have to plunge themselves into debt just to get a college education. So it will not make a college education any cheaper. In fact, costs are likely to get worse. At The Elevation Group, we believe education is extremely important, especially when it comes to your finances. That's why we've made it our mission to share financial wisdom, entrepreneurship and the investment strategies of the rich with the middle class. Unfortunately, because of this madness, this kind of education is needed more than ever. The average college graduate starts their professional life $30,000 in debt. That's a deep hole and a major disadvantage when you're just trying to make your start in the world. If you, or someone you care about is in that situation, you'll have to play the rest of your financial cards right. Mike Dillard recently prepared a special presentation on how anyone can invest and grow wealth the same way the rich do if they just have the right knowledge and teachers. It's free to watch, making it a truly affordable education to anyone. PS If you know anyone with large student loan bills, you may want to share this article with them.